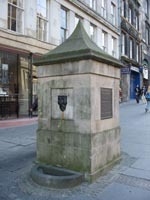 Until 1820 these stone well heads (seen punctuated down the Royal Mile at the Lawnmarket, High Street, Netherbow and Canongate) were the only means by which the thousands of Old Town inhabitants could access water. They were also places were locals would meet and gossip. The source of this supply, Castlehill Resevoir (1681) was replaced by a new system in 1851. The 1.7 million gallon capacity was fed by springs from the Pentland Hills. The Resevoir was decommissioned in 1992 and converted into a unique working tartan mill. Narrow necked buckets called ‘stoups’ were used to collect and contain water and a ‘girr’ used as a means of providing stability to the carrier. ‘Caddies’, who offered a delivery service carried it in a purpose bulit barrel strapped to the back. 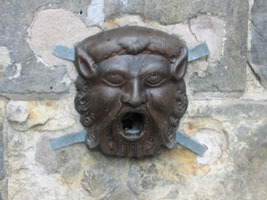 The council would ration the water when it was in short supply during, for example, the summer months. Since this meant that local residents could only use the wells between midnight and 3 a.m. queues and fighting were commonplace.